Thanks for visiting Lakota Leathers Ebay sales. Lakota Leathers produces the finest instrument straps that you can purchase. This auction is for one Lakota Leathers Buffalo hide banjo strap. Each of our banjo straps comes with a single 48″ tailpiece that completely circles your banjo pot assembly, then attaches back to the main section of the strap. It is safely secured by 2 Chicago screws. (see video below) Our straps are the softest, most comfortable strap you will ever try. The bison hide is very unique and supple and offers unsurpassed comfort and strength. The strap in the photo is one of our ‘chocolate’ banjo straps. These straps are available in four colors; black, chocolate, saddle, or tobacco. Please specify your color choice when ordering. If you do not specify, you will receive the “Tobacco” color as shown in the photos. Our straps are produced on the Pine Ridge Indian reservation in South Dakota and are 100% guaranteed. Each strap sold will help a family on the reservation. Pine Ridge is home to the poorest county in the entire United States. Thanks for stopping by. Fast, Friendly and Professional!! Great Mandolin Straps!! A+++++++++’s!! This is a wonderful guitar strap.Very satisfied. Shoot, those folks were all over my order. It came in a hurry and I am happy. Well made strap, is extremely soft. No need for padding. Good seller. Nice strap. FAST shipping. Would buy from seller again! Awesome strap! Great seller–bid with confidence and pleasure. Thank you!! Great communication; fast shipping;lovely strap. Perfect transaction! Thank you! Absolutely beautiful and delivered in 2 days, amazing. Will tell others to buy! Very Nice strap!Very comfotable!And fit me well,with room to spare,ugotta get 1. These people are so fast it arrived before I ordered it! Gorgeous banjo strap and lightening fast shipping – Thanks so much! Lovely strap. Great price. Fantastic service. Just love the strap. Thank you. Quick shipping and a soft strap!! This is a beautiful mandolin strap…and lightning fast delivery! Thank you! Unbelievable!! Cant say enough about the comfort. Awesome product !! I am looking forward to receiving it and getting it on my Banjo. I have looked at a lot of straps and I liked your style and design the most. my black and gold mando strap arrived yesterday–perfect length, super comfortable, fits easily in my shaped case. And I love the colors–she’s a byoot! Thanks for a terrific mando strap! I’ll show it off at ZoukFest in June. My strap arrived on Friday and I am super impressed. I spent more time playing the banjo over the weekend than I ever have just because the strap is so comfortable. Just wanted to let you know I received my new black bison mandolin strap and it is the best leather strap I have ever laid my eyes or hands on. I just received my bison hide mando strap. It is perfect! It could not be any better! The strap arrived today. Great color, very soft. 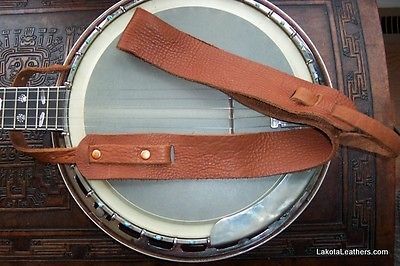 Tobacco Color LAKOTA LEATHERS 2" Cradle Banjo Strap BISON BUFFALO Leather!